Coach Sarah has taken the Grappling scene by storm since she started training Brazilian Jiu-Jitsu in March of 2013 and she is showing no sign of slowing down. She has won Gold at almost every local competition as well as bringing home a total of 5 medals from the three of the most prestigious tournaments in the world; The Abu Dhabi World Pro, The IBJJF World Championships, and The IBJJF European Championships. Sarah also holds a green belt in Judo which she received from Sensei Dainis. Her passion for Brazilian Jiu-Jitsu (BJJ) is like no other when she is not teaching or training you can always find her watching instructional videos and reading martial arts books. She is quite the avid student of the game and her competition results speak for themselves, in her short time of training she has managed to become one of most accomplished female grapplers to come out of Canada. Apart from tearing apart the competition, doing Yoga classes and personal training, Sarah loves to teach and is an excellent instructor. She has has an ability like no other to make everyone feel welcomed at the gym and to break techniques and movements down to make them easy for beginners to understand. She does every new student's first trial class here at DNA BJJ, an intro to Brazilian Jiu-Jitsu lesson. Sarah is a certified Yoga instructor with over 200 hours of experience and as a result she is incredibly well versed in body movements and breaking movements down to make it easier for our kids and new students to understand. She is also certified in Ginastica Natural. Her goal is to bring more females into BJJ so that they may experience all of the benefits that Jiu-Jitsu has to offer such as confidence, fitness, and the ability to defend themselves against anyone. Sarah specializes in helping kids and youth, especially the young girls, feel comfortable in a male dominated sport and as a direct result we have a huge female team, roughly one third of our students are females. 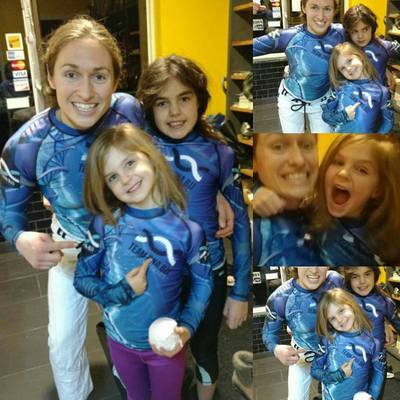 She really knows how to teach the kids important skills while making it really fun for them and bringing a smile to their faces, once they do their intro to BJJ class with her - they will be hooked. If you live in Durham Region in the Ajax, Whitby, Brooklin or Oshawa area, contact us to book your free intro to BJJ lesson with Coach Sarah or check out her BJJ movements class on Sunday where she blends Yoga, BJJ, and fitness for one fun fitness class for all ages that will greatly improve your movement and flexibility.